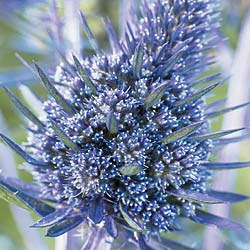 Modern Gardener: Eryngium planum Paradise Jackpot......A Perfect Companion For Roses! Eryngium planum Paradise Jackpot......A Perfect Companion For Roses! Masses of bold violet-blue blooms! Sea Holly is often overlooked as a choice for the perennial or Rose garden, yet few plants offer so many merits. The blooms are brilliant violet-blue in an unusual shape that complements surrounding plants, while the plants tolerate everything from drought to blazing sun, and are left alone by nibbling deer. Try Paradise Jackpot in the garden this season and I predict you'll be convinced! These blooms are only 1/4- to 1/2-inch wide, but they boast layers and layers of stiff, spiny blue bracts that really make them stand out. And they're unbelievably profuse, crowding onto plants just 26 inches high and 24 inches wide. Long popular as a dried flower, they are also lovely in fresh arrangements as well as in the garden. Paradise Jackpot blooms heavily from midsummer until fall, needing very little attention to keep looking its best. This is the perfect plant for the xeriscapic garden, for once established in your soil, it can survive periods of drought beautifully. And it's ideal for the perimeter of the property, where nibbling creatures tend to leave it alone. But this Sea Holly also makes a fine companion to Roses, both in the garden and the vase. The unusual shape and deep blue color shows off just about every Rose -- try it alongside Yours Truly or Let Freedom Ring, for example. You'll find many uses for this unusual flower form and color! Space Paradise Jackpot plants about 2 feet apart in the sunny to lightly shaded garden. They thrive in average to poor garden soil, and bloom freely for many seasons. Zones 5-8. Where can you buy this plant? I live in Ohio, zone 5.